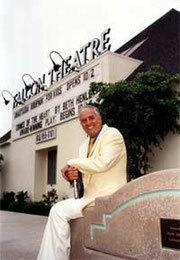 2003 trat Jack Klugman im Falcon Theatre (Burbank CA) mit seinem Programm "An Evening with Jack Klugman" auf. Und zwar zwischen dem 17. September und 9. Oktober. Emmy-Winner Jack Klugman erzählte aus seinem Leben. Die Tickets kosteten zwischen $25.00 - $37.50. Für den dreifachen Emmy-Gewinner waren diese Abende sehr wichtig. War es auch ein Schritt zurück auf die Bühne und zwar ganz alleine. In dieser "One Man-Show" erzhälte der Jack, was er in einem halben Jahrhundert Showbusiness so alles erlebt hatte. Natürlich erzählte er über "Männerwirtschaft", "Qunicy" und auch sein Krebs war ein Thema. Man konte auch viel über seine Filmpartner wie Humphrey Bogart, Henry Fonda, Ethel Merman, Judy Garland, Tony Randall erfahren. Man kann davon ausgehen, dass hier die Idee für das Buch "Tony and Me" enstanden ist. Sind die Themen und Geschichten identisch. "INSPIRATIONAL is the word most people were using that night...a wonderful two hours of theatre, that are both humorous and hearwarming... Memorable..."
"If you're a fan of show biz anecdotes, you'll find an embarrassment of riches in An Evening with Jack Klugman... An impressive feat by any standards, a cozy fireside chat, with Klugman as garrulous host." "The evening was a captivating celebration of Klugman's theatrical virtuosity... A master class in economic expressiveness, where the most effortless inflections often produce the biggest laughs..."
"An Evening with Jack Klugman... is a thoroughly enjoyable two-hour sojourn down 81-year-old Klugman's memory lane." Das Falcon Theatre liegt im Burbank's Media District in der Nähe der Disney Studios, NBC, Warner Bros. und den Universal Studios. Das Falcon Theater gibt es seit 1997. Gebaut wurde es von Garry Marshall. Garry Marshall war Produzent von Männerwirtschaft. Es ist natürlich kein Zufall, dass es Jack Klugman mit seinen Produktionen immer wieder in sein Theater zieht. Auf dem Bild sieht man Garry vor seinem eigenen Theater. 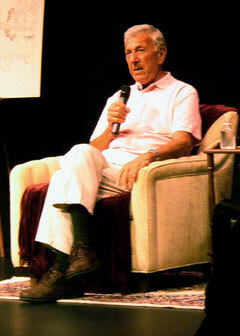 Jack Klugman is one of television's most popular actors, having starred in such memorable shows as The Odd Couple and Quincy. The evening will offer an intimate dialogue between the audience and Mr. Klugman as he shares stories from his over half-a-century in show business. Klugman will speak about working with such legendary figures as Humphrey Bogart, Henry Fonda, Ethel Merman, Judy Garland and Tony Randall. He will also share his emotional experience battling and surviving throat cancer. This is a rare opportunity to see a Hollywood legend, up close and personal! The Miramar Theatre has reached an agreement with legendary film & TV director Garry Marshall (TV: “Happy Days,” “Laverne & Shirley,” “Mork & Mindy,” films: Beaches, Pretty Woman, The Princess Diaries) and Theatre a Go-Go, Inc. to present a Special Limited Engagement of the one-man show, AN EVENING WITH JACK KLUGMAN, starring three-time Emmy Award winner Jack Klugman (“The Odd Couple” & “Quincy, M.E.”) at the Miramar Theatre beginning Friday, May 14th for 8 performances. The show premiered this past fall to critical acclaim at Marshall’s FALCON THEATRE in Los Angeles, CA. This is the tryout engagement for a proposed multiple city national tour to be presented by Marshall and produced by Theatre a Go-Go. AN EVENING WITH JACK KLUGMAN offers an intimate conversation with the three-time Emmy Award winner as he shares stories from his over half-century in show business. 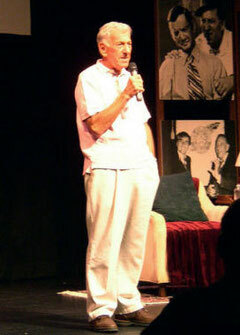 The show’s unique format consists primarily of Mr. Klugman answering a wide variety of questions submitted by the audience. Upon entering the theatre, audience members are given the opportunity to write questions for a moderator to ask during the show. The result is a truly original piece of spontaneous theatre at each and every performance that has proven to be both inspiring and deeply personal. Mr. Klugman shares “behind-the-scenes” stories about such legendary stars as Henry Fonda, Humphrey Bogart, Ethel Merman, Walter Matthau, Jackie Gleason, Judy Garland, Tony Randall, and many others. JACK KLUGMAN was born on April 27, 1922, in Philadelphia, PA, the youngest of six children. Growing up in South Philadelphia, PA, Klugman knew he wanted to be an actor, and following his WWII army service, he used his GI bill to attend Carnegie Tech in Pittsburgh. After hustling small roles and summer stock parts, his first big break on the New York stage came appearing opposite Kim Stanley in St. Joan and in Stevedore with Rod Steiger. He made his Broadway debut in the 1952 revival of Clifford Odet’s Golden Boy with Lee J. Cobb and John Garfield. Other early Broadway appearances include The Odd Couple, Gypsy (with Ethel Merman), Tchin-Tchin and The Sudden and Accidental Re-Education of Hore Johnson. He also toured the country with Henry Fonda in the acclaimed Broadway comedy, Mister Roberts. His numerous film appearances include: Timetable (1956), Twelve Angry Men (1957), Cry Terror (1958), Days of Wine and Roses (1962), Act One, The Yellow Canary and I Could Go on Singing (1963), Hail, Mafia (1965), The Detective (1968), Goodbye Columbus (1969), Who Says I Can’t Ride a Rainbow (1971), The Two Minute Warning (1976), and Dear God (1996). Besides The Odd Couple (1970-75), and Quincy, M.E. (1976-83), his other television series were The Defenders (1963-64), Harris Against the World (1964-65) and You Again? (1986-87). He also appeared several times on Rod Sterling’s classic television anthology, The Twilight Zone. His star-studded career has earned him many prestigious awards, including three Emmy awards, his first for Best Actor in a Dramatic Series for The Defenders, and two for Best Actor in a Comedy Series for The Odd Couple. Other accolades include: a Golden Globe award for The Odd Couple, a Tony award nomination for Best Actor in a Musical for Gypsy, and even a Chloe award for his role in an Eagle Brand Snacks commercial. It is theatre, however, that has afforded Mr. Klugman his most artistically rewarding experiences. He returned to the Broadway stage in the late 1980’s in Herb Gardner’s Tony award-winning play, I’m Not Rappaport and in the 1993 revival of Three Men on a Horse. In 1996, he and Tony Randall reprised their hugely popular television roles in the London revival of Neil Simon’s The Odd Couple. Again with Tony Randall, he starred in the 1997 Broadway revival of The Sunshine Boys with Mr. Randall’s company, the National Actors’ Theatre. Mr. Klugman recently completed filming the feature film When Do We Eat and his one-man show AN EVENING WITH JACK KLUGMAN premiered to critical acclaim this past October at Garry Marshall’s Falcon Theatre in Los Angeles, CA.